Who can forget Lord Krishna as portrayed by Nitish Bharadwaj in the famous Mahabharata series that used to be shown on national television? And most people still say that he is an ideal choice as Krishna. Nitish Bharadwaj also starred in a Malayalam movie called ‘Njaan Gandharvan’ which created ripples in the film industry right from the time its much acclaimed director Padmarajan announced it. I believe that the director could pull it off mostly because of one person’s amazing presence and acting – Nitish Bharadwaj. 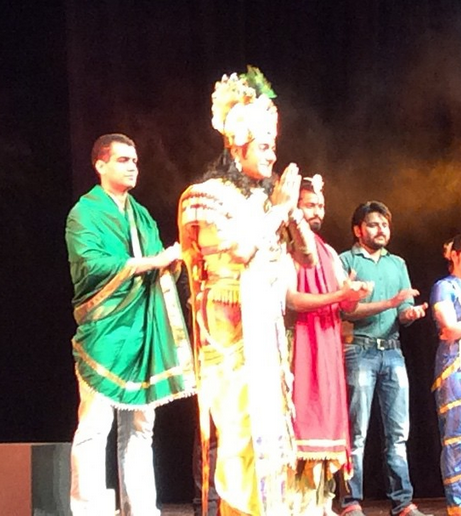 And so, it happens that after a gap of 25 years Nitish Bharadwaj acted in a play titled ‘Chakravyuh’ written and directed by Atul Satya Kaushik. Of course, i was excited and thrilled to get an opportunity to watch him! Counted every minute to the play! And when I got there, it turned out that I was in the third row! Could see 'Lord Krishna' real close!!! Okay, stop, stop, I am getting goosebumps on my skin! ‘Chakravyuh’ is an attempt to present the glorious tragic fall of Abhhimanyu, the brave son of Arjuna and Subhadra and nephew of Lord Krishna. The hidden meanings of this episode in the Mahabharata is presented with thought-provoking dialogues between Lord Krishna and the others. I thoroughly enjoyed the play. What amazed me is the effortless ease with which Nitish Bharadwaj becomes Lord Krishna even after so many years. There is magic in his eyes and in his smile. His expressions, from playful mischief to serenity to seriousness, lend depth to the character of Lord Krishna that he is playing. The play also marked the entry of his son, Lalit Bharadwaj (dressed in a pink and blue outfit as shown below, standing at his side). Many scenes played by Lalit Bharadwaj received the applause of the audience because of his acting and dialogue delivery. Another striking character that deserves a special mentionis Duryodhan (featuring Rahul Bhuchar). In terms of screen presence, acting and dialogue delivery, he stands out too. The play ‘Chakravyuh’ has impeccable lighting effects by Atul Satya Kaushik and beautiful music composed by Ravi Rao and Latika Jain. There are many thought provoking dialogues in this play. Lord Krishna’s response is a heart-wrenching one. You have to watch this play to experience it. Atul Satya Kaushik is an alumnus of Sri Ram College of Commerce (SRCC, Delhi) and is a qualified CA and holds a degree in law. Still to reach 30s, Atul Satya Kaushik has already written 10 full length theatre plays and produced and directed 12 theatre productions with over 150 shows in different parts of India. He is credited with pioneering modern commercial theatre in Delhi and running many ticketed plays full houses in his theatre productions. He formed ‘The Films and Theatre Society’ in September 2009 and it is fast becoming one of the most performing theatre groups in Delhi. 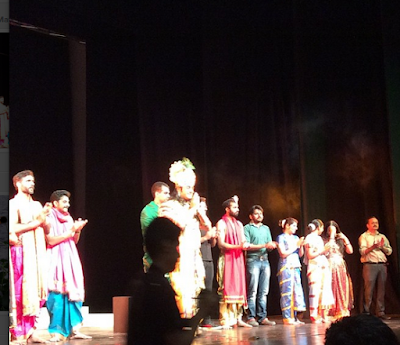 I was so super excited after watching the play ‘Chakravyuh’ that I couldn't help tweeting about it. The responses I got were "Most authentic enactment of Krishna" and "He doesn't even have to try, it comes naturally!" 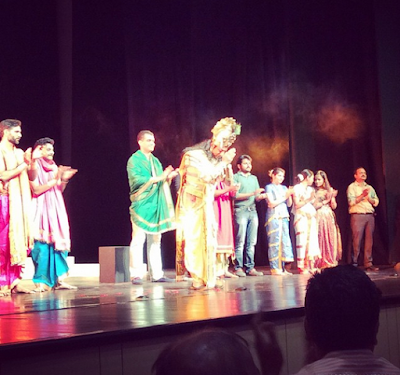 See, people LOVE watching Nitish Bharadwaj as Lord Krishna!